Star Wars is in the news right now, in case you hadn't heard. Remember in the prequel trilogy when ol' Chancellor Palpatine decided that it was time to get rid of his little 'Jedi problem' so that he could have "peace" in the galaxy? He executed Order 66, and just like that the Jedi were out of his way. It was that simple. Problem solved! As a disclaimer, I should mention that I'm not saying I want Yzerman to send some Clone Army to wipe Stamkos off the face of the planet. I'm not suggesting that I think Yzerman is some evil mastermind like our friend the Emperor. 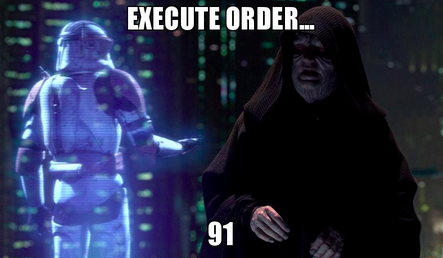 I'm not even suggesting that "executing Order 91" would be the worst thing in the world, as Order 66 clearly was. That would all be just a *tad* silly. Rather, I'm suggesting that I believe "Executing Order 91" (i.e. trading Steven Stamkos) might be the best thing to do right now. Because, really, Stammergeddon 2.0 isn't getting any better. But, just because something might be the best thing to do doesn't mean that it's an easy thing to do. As the title says, it's complicated. As background, I'll quickly note that this trade talk isn't coming out of nowhere. If I thought that there was a semi-decent chance that Stamkos would re-sign with the Lightning, I wouldn't even be considering the idea of trading him right now. "Just hold on until the deadline," I would suggest. "There's still a chance," I would whisper while crying myself to sleep. This is a player I truly enjoy watching, and I'll certainly be sad if (*cough* when *cough*) he leaves. Steven Stamkos won't be playing for the Tampa Bay Lightning next season." When Bob speaks, the hockey world listens. If Bob has enough of a reason to believe, and subsequently go on record with the belief, that Stamkos won't be playing in Tampa next season, it's hard to ignore. He does note that he can't make the claim with absolute certainty, but his words don't exactly give me much hope that #91 will be back in Bolts blue for 2016-17. So, what's the answer then? If I'm the Lightning, I don't want to sit around and continue playing this waiting game. Does it make sense to hold onto that last strand of hope, even if it means losing Stamkos for nothing on July 1, 2016? It doesn't. A handful of teams have made that mistake recently, and it's just not worth it (See: Devils, New Jersey and Parise, Zach as an example). All the tea leaves, including McKenzie's very tuned tea leaves, point to Stamkos leaving. Losing him for nothing simply cannot be an option, especially with this much forewarning. Some people will undoubtedly suggest that the Lightning are a contender, and that they should ride it out and go on one last run with Stamkos even if it means watching him walk for free in July. I completely disagree. At some point this becomes about more than the 2015-16 season; it's time to think about long-term asset management. The Bolts have an incredibly valuable player who, by all accounts, is on his way out. Maximizing the value they can get for him should be the number one priority, even if it means a little bit of pain in the short-term. "And, realistically, what team is going to give up significant players and/or draft pick assets to Tampa before Feb. 29 when it could just sign him on July 1 with an acquisition price of gratis?" That's an excellent question. What team is going to give up a boatload of goods knowing that he will likely be available on July 1st? If you're a smart team, are you going to mortgage your future for a couple months of Steven Stamkos when you can take a free shot at him later? Probably not. It's for that reason that I believe Yzerman should look to deal Stamkos now, as said. Stamkos' value likely isn't increasing between now and the deadline, but teams might be willing to pay a little more for an extra two months of Stamkos on the ice and exclusive negotiating rights off it. It's a long shot, especially if you believe that he wants to test the free agent waters, but if the Lightning can find some team that is willing to throw upwards of $12M per season at him and convinced that he'll take the money and run, it just might work. Even then, though, is an extra couple months enough of an incentive for a team to give up full value for a former perennial 40-to-50-goal scorer who has been invisible recently? It's tough to say. I struggle to believe that the Lightning will get full value for Stamkos, regardless of if and when they decide to trade him. With that in mind, it's worth noting that the 'trade now' option isn't all that simple, either. That's why the title of this blog spells out that any Stamkos trade is a complication proposition. The Captain has a full no-move clause and a full no-trade clause attached to his contract. Stamkos is in complete control of his destiny, much like Luke Skywalker was when he decided to thwart the dark side's advances. And that makes things difficult for Steve Yzerman. ...which puts us right back at square one. Like I said: Complicated. Trading him might be the most appropriate option, but as outlined it's also an incredibly difficult thing to do. In short... Good luck, Steve. You're probably going to need it. For the first time in a long time, thanks for reading.